DMSatFinder saves your time and helps get best possible signal level from your satellite dish. With Enigma2 based box (e.g. Dreambox) and DMSatFinder it would be a matter of minutes. Requires: Android 2.2 or higher, Enigma2 based satellite receiver, WiFi network connection. DMSatFinder connects with your Dreambox (or other Enigma2 based box) by WiFi network and reads satellite signal levels from it's built-in satfinder. These values are then displayed in real time on your mobile device. According to received signal quality you can hear "beep" sound. Better signal means more frequent beeping. You can hide mobile device deep in your pocket, listen indication sound and then align your dish with both hands. No need to ask another persons for help. Could it be easier? You want to check signal quality for all your favorite channels while standing on the ladder? No problem! Just use DMSatFinder's channel switcher and make sure your dish is perfectly aligned. 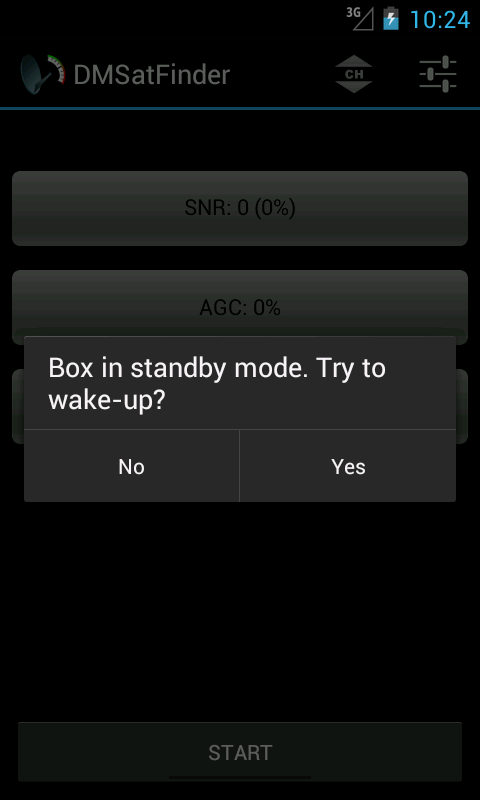 And if you realize that forgot to power on satellite receiver from standby mode, DMSatFinder will wake it up for you. No more running up and down like crazy. DMSatFinder respects your privacy. It only requires network access to establish connection with satellite receiver. Unlike most of free applications it is not interested in accessing your Contacts, Emails, SMS messages or any other personal data. So you have nothing to worry about. First you need to know IP address of your box. Refer to the "Network" section in your box "Settings" or "Preferences" menu. Run DMSatFinder and go to the "Settings" menu. 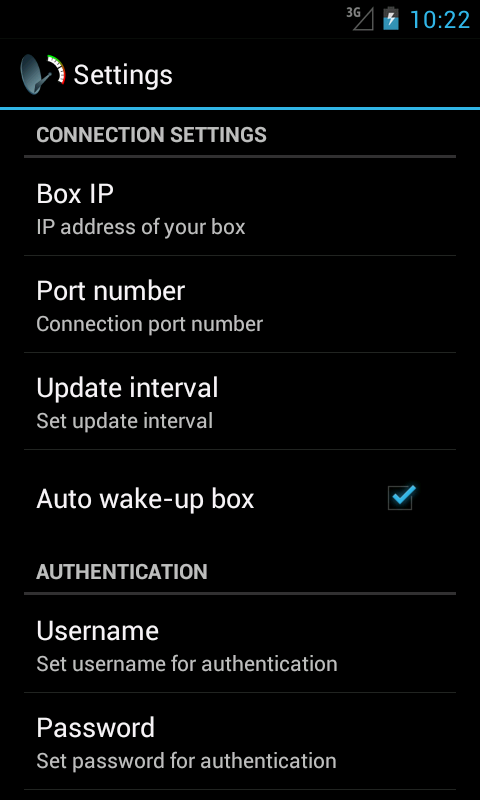 In most cases it is enough to just enter proper box IP. Unless your box is protected with login and password or WebInterface is running port other than default "80", this should be enough to start using DMSatFinder. Close settings and you're done. Seriously, that's all! Where can I find my box IP address? It depends on Software which your box is running. In general you have to look on "network settings" or "networking info". IP address will probably looks like e.g. "192.168.1.10" or similar. To test if it is correct enter IP address in browser address bar on your computer. Page with Enigma2 WebInterface should be loaded. Will this app work with my box/receiver? DMSatFinder requires Enigma2 based box. For example Dreambox HD receivers are valid, but it will probably run fine on any box with Enigma2 on board - original, chinese clones, DYI modified etc. - assuming that WebInterface is enabled (which should be by default). Doesn't work for me! Why? Believe me or not: it does work. Every release was tested (special thanks for guys from dvhk.pl forum) before it was publicly available. If it doesn't work for you, then consider few options. First make sure that your box is running Enigma2 software. If so, check if WebInterface is enabled and accessible by network - refer to "Where can I find my box IP address?" FAQ section for details. Check if both - satellite receiver and Android device - are in the same local network. If not, then some "administrator magic" could be required, e.g. forwarding port "80" on your router to IP of box. Working in one local network is easier and recommended. Double, or even triple, check application settings: box IP, port number, access credentials and other. You can test it with internet browser on your computer. This app is great! How can I say thanks? I'm really glad you enjoy it. Your rate and review on Google Play would be appreciated. Also feel free to just send me an email with few nice words. If in your opinion it's not enough, you can always buy me a beer or send chocolates :) Contact me if you wish. DMSatFinder is free so I cannot quarantee full technical support. But you may be sure that I'll do my best to answer everyone's questions.